GlotPress 2.0.1 is now available for download or update in your WordPress dashboard! This is a bugfix release addressing issues found in version 2.0. #386: Avoid a PHP warning when a user had made translations and the user was then deleted. #390: Update all delete permission levels to be consistent in different areas of GlotPress. #404: Fix the CLI export command to properly use the “status” option. #417: Exclude the art-xemoji locale from length check that caused spurious warnings. #411: Add Haitian Creole locale definition. #412: Update Asturian locale definition. In this version 6 issues were solved and 6 Pull Requests were merged, a total of 14 commits. Contributors of this release: Dominik Schilling, Greg Ross, Yoav Farhi. Hello everyone! I’m Arian, a Computer Science student, one of the students accepted in the Google Summer of Code Program. This is my 7th update, and you can view my other posts here. This week I’ve made changes to previous features implemented, specifically, the Public Profiles and the Installation Script. Most of the changes has been internal, setting up proper functions/API, and reconstructing the code flow to fallback to sensible defaults. This week I also managed to add a small change: you can now view the validators of a translation set, with their names linking to their profiles! The next weeks will be interesting, where general polish, closing down standing tickets in the trac, and more comprehensive unit tests to features added will be the main focus for development. I’ve created a little mockup screen I wanted to share with the glotpress people. 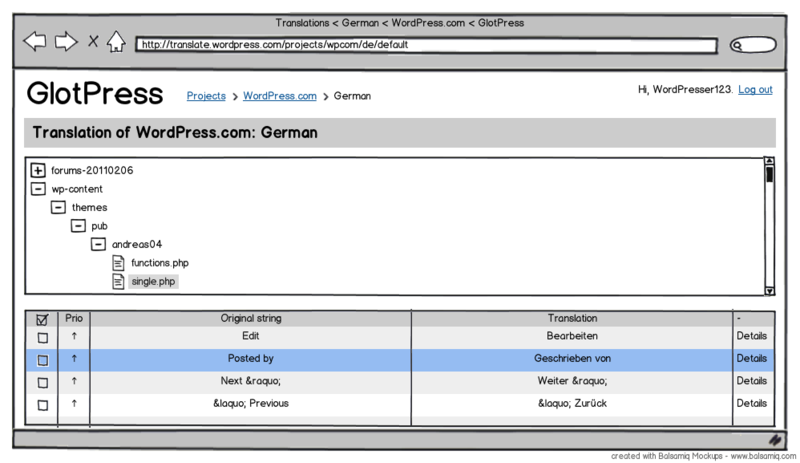 This would help to bring some order in the huge amount of different strings on translate.wordpress.com and would help to get the context of a string. Well in a perfect world every string on translate.wordpress.com would come with a screenshot where the string to be translated would be highlighted in any way.